When was the last time you went ice skating? Discover how much fun it can be to spend a couple of hours practicing your skating skills and having a few laughs with family and friends! Ice skating is one of the many winter activities that's great for children and adults alike. 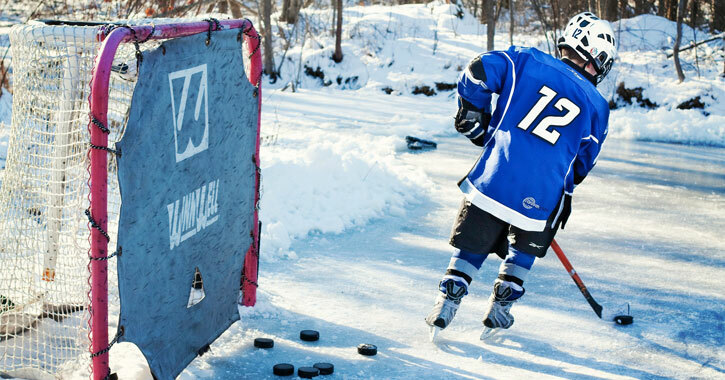 In addition to figure skating, rally a group of friends together for a game of pond hockey. Saratoga Springs Ice Rink - This year-round, indoor skating arena is on Weibel Avenue. Saratoga Spa State Park - Saratoga Spa State Park has two seasonal outdoor rinks. Hockey is allowed at the rink just off Avenue of Pines, but not at the rink near Victoria Pool. Gavin Park - Gavin Park in Wilton has a public ice rink available as weather permits. Outdoor bathrooms will be open. Bring your own skates. Jenkins Park - This park in Burnt Hills has two ponds for ice skating and hockey in the winter. Saratoga Lake - Visitors can enjoy ice skating at the South Shore Marina. Ballston Area Recreation Commission (BARC) - BARC sponsors ice skating in conjunction with resident volunteers and the Village Department of Public Works. Clifton Park Ice Arena - Located in Clifton Common, the Clifton Park Ice Arena features two NHL regulation rinks.